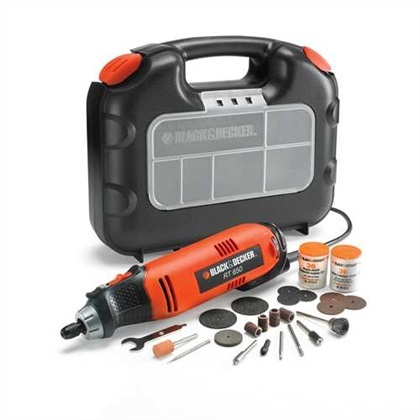 The Black & Decker Rotary Multitool Kitbox RT650KA sands, cuts, grinds, polishes, cleans and much more. The powerful 90W, 27000rpm high torque motor completes jobs faster and won’t slow down under load. This Black & Decker Rotary multitool kitbox features a flip-lock spindle lock for quick and easy accessory changes whilst the universal collet system accepts all standard rotary tool accessories and features a variable speed for maximum precision in all applications. Separate variable speed dial for “set and forget” convenience. This entry was posted in DIY Featured, News & Offers, Special Offers & Featured Products and tagged diy, power tools.